MOSCOW, May 23. /TASS/. Russia’s legendary ice hockey player and UNESCO Goodwill Ambassador Vyacheslav Fetisov said on Wednesday he hoped that President Vladimir Putin will participate next year in an international ice hockey game at the North Pole. Russia’s two-time Olympic champion and three-time winner of the NHL Stanley Cup Fetisov announced plans earlier to organize a friendly international ice hockey match in 2019 on the territory of the Barneo Ice Camp, which is a unique Russian-operated drift station on the frozen Arctic Ocean near the North Pole. According to Fetisov, the aim of the event is to draw attention of the international community to the problems of the global climate change. Ice hockey stars from Canada, the United States, Norway, Finland, Denmark, Sweden and Iceland have already confirmed their participation in the planned match. "We hope that the president of Russia will take part in the game at the North Pole," Fetisov, who is also a Russian lawmaker with the parliament’s lower house, stated at a Wednesday news conference in Moscow. "It is highly possible that besides ice hockey stars we will invite famous athletes to take part in the event representing other sports, for instance football and croquet, as well as other prominent people in other spheres," Fetisov added. 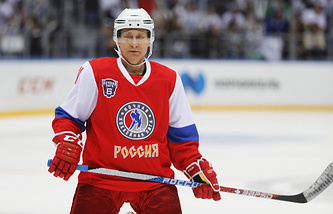 The Russian leader first appeared on the ice, playing hockey in 2012, just several hours after his inauguration and it was as part of the traditional Night Ice Hockey League. He played regularly since then at this annual event and during the most recent match of the Night Ice Hockey League, held less than two weeks ago, Putin scored five goals. 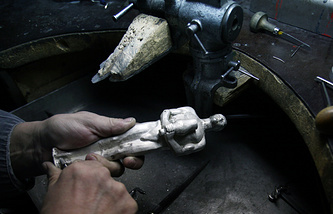 The Night Ice Hockey League was founded at Putin’s initiative several years ago. Hockey enthusiasts started gathering at sports stadiums during their spare time, usually late in the evening (hence the league’s name) to play their favorite game just for fun. Renowned Soviet and Russian hockey stars joined the initiative to help arrange for regular competitions involving amateur teams across Russia in a national tournament.